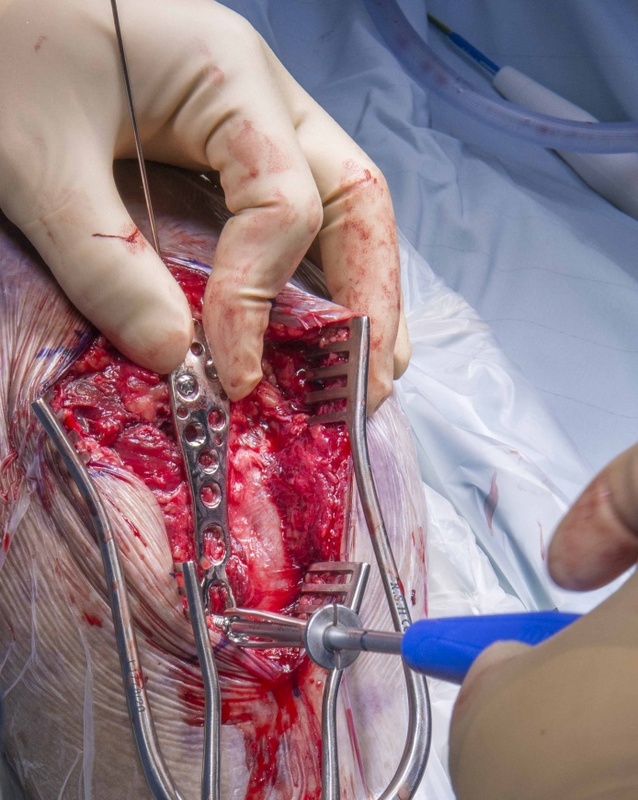 Subscribe to get full access to this operation and the extensive Shoulder & Elbow Surgery Atlas. Learn the Internal Fixation of Olecranon fracture using Synthes LCP Olecranon plate surgical technique with step by step instructions on OrthOracle. Our e-learning platform contains high resolution images and a certified CME of the Internal Fixation of Olecranon fracture using Synthes LCP Olecranon plate surgical procedure. Olecranon fractures comprise around 10% of all fractures around the elbow. They have a bimodal distribution and usually occur as high energy injuries in the young, and low energy falls in the elderly. These can occur as a direct blow, resulting in comminuted fractures, or indirectly, as a fall onto an outstretched hand, resulting in transverse or oblique fractures. The position of the elbow can influence the pattern of injury. Radial head and coronoid fractures have been shown to occur in laboratory testing at flexion of less than 80 degrees, olecranon fractures at 90 degrees of flexion and distal humeral fractures at greater than 110 degrees (Amis AA, Miller JH. The mechanism of elbow fractures: an investigation using impact tests in vitro. Injury 1995;26:163–8). Anatomically it is worth remembering that the olecranon, with the coronoid process, form the greater sigmoid notch and form the ulno-humeral articulation that acts as a primary stabilisers of the elbow (along with the medial and lateral collateral ligament). The olecranon receives the insertion of the triceps, as well as the anconeus on the lateral side. 1 – Comminution. If there is comminution, there is not enough inherent stability and the fixation is at risk of biomechanical failure as the tension forces are unable to be transferred into a compressive force. 2 – Obliquity of the fracture. The more oblique the fracture, the more the acting forces deviate from the line of action. This introduces a flexion moment and again, is theoretically less robust. 3 – Fractures distal to the centre of rotation to the elbow joint. Fractures that occur distal to the centre of rotation, again introduce a flexion moment to the fracture and can affect stability, and therefore risk failure. 4 – Associated fractures. Coronoid fractures, radial head fractures and Monteggia type fractures can increase instability in the elbow that a tension band fixation is not designed to neutralise. If all these factors are satisfied, tension band fixation is a good option. If all the criteria are not satisfied, it does not exclude tension band fixation as a fixation method. It requires, like all surgery, weighing up the pros and cons of the fixation method. In my own practice, if these criteria are not satisfied, I opt for pre-contoured Synthes anatomic locking plates. The design of the plate allows more screw options particularly with regard to hold in the proximal fragment, which can be small and multi-fragmentary in some cases. I believe that these plates also offer superior fixation as a result of the fixed-angle construct. This is especially the case if there is concern regarding bone quality in terms of osteoporosis and osteopaenia. Institution :The Queen Elizabeth Hospital, Birmingham ,UK.